Thank you for your interest in graduate study with my group at Kellogg Biological Station (KBS), where I am a resident faculty member. In my view there is no better place for graduate work in ecology and environmental science than KBS. We are located on Gull Lake, about 75 minutes southwest of campus. KBS might be described as a hybrid between a field station and a small satellite campus; we have the ambiance of a field station but our infrastructure and lab facilities are as good as those on campus. As an academic unit, KBS is unique because the faculty spans the range of ecological subfields and includes members of several different home departments. Recent additions to our faculty bring expertise in social science and animal science as well. Many students are attracted to KBS not only for the academic programs but also because the diverse local landscapes present attractive study sites for all kinds of ecological research. Affordable housing is available on our extensive rural property. The nearby City of Kalamazoo and Western Michigan University offer cultural and urban amenities. Doctoral students generally spend their first 2-4 semesters on campus taking courses, then move to KBS to do their thesis research. Students in the Master's program can accomplish their field research during the summers but often choose to spend time in residence at KBS as well. 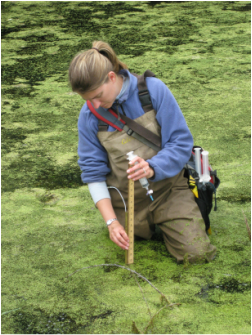 Most KBS graduate students choose to affiliate with the interdepartmental Ecology, Evolutionary Biology and Behavior (EEBB) program, in addition to their home departments. There is also another interdepartmental program called Environmental Science and Policy, and a water science curriculum is being developed for that program. I am involved in both of these programs. If you have not already been there, I suggest that you start at my home page (http://www.kbs.msu.edu/faculty/hamilton/) to see what research I have going on. Go to my lab web site (weebly.com) for details. You can also back up from the KBS faculty page to the general KBS web page, and you can look at my home department on campus for graduate program requirements (www.zoology.msu.edu), since my graduate students would normally be in that department. Then I can furnish you with more specific information. It is important that we establish a dialogue about your potential interests so that I can determine whether I would be your best choice as a mentor and how you might best be able to fit into my research group. Once you decide you'd like to apply and to list me as a potential sponsor, we will communicate further before you send in the application materials. In my home department (Integrative Biology), we attract students of high caliber and hence it is quite competitive. Therefore I suggest that you send me a copy (unofficial copies OK at this stage) of your transcripts and your GRE scores (the three parts of the general test and, if available, the subject test) before you submit your application. I can tell you your likelihood of acceptance in our department and your chances of obtaining a fellowship from outside sources, and this will save you from paying the MSU application fee and requesting letters a recommendation before you know your chances of success. Also, there may be something you could do to improve your chances before the deadline. There is a general MSU application as well as a specific department application. Ideally your application will be complete by 1 December, to receive full consideration for financial aid in the form of recruiting fellowships for doctoral students (US citizens). In any event the application must be complete (including letters of recommendation) by mid January. Only students sponsored by a faculty member are considered by my department.